Illustrated definitions are rarely found in zoning and development ordinances. Ordinances prefer the "thousand words" rather than the "single picture." Illustrations greatly simplify how standards should be applied, particularly where the lot or parcel is irregularly shaped or where there are a number of variables present, each of which might have an impact on how the ordinance might apply in a specific situation. 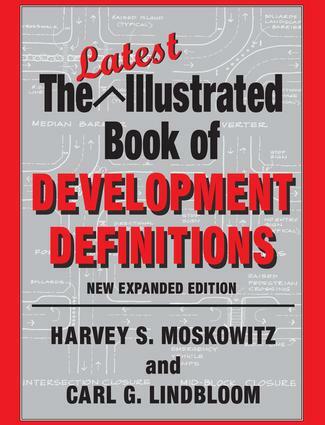 This best-selling resource has been the mainstay of the planner's bookshelf since its first publication and it differs from other books and publications containing development definitions in three major respects: It is illustrated; most of the definitions are designed to be used directly in ordinances with little or no change; and the more complex definitions are accompanied by commentaries and annotations that explain how the definition may be used in an ordinance, along with background information pertinent to the definition. This expanded edition standardizes in one handy reference all the key terms used in zoning, subdivision, site plan, and environmental ordinances. In all, it contains 1,957 definitions and 103 illustrations that can be incorporated in local ordinances with little or no change. Written and illustrated by two professional planners with nearly eighty years of combined experience in the practice of planning and zoning, this is a basic working tool and required reference for anyone involved in land development planning and regulation.